Then, using “official” patterns only for this challenge (here are the ones posted on my TanglePatterns.com site), fill each section with a pattern whose initial letter begins with the letters of your name. There are all kinds of possibilities with this concept because you can tangle any inspirational word you like … hmmm, think I’ll start with LOVE. That looks like a lot of fun. And your “name” turned out gorgeous. The trick to making it look great is the placement of the various tangles, so this is a really creative project for everyone. Ooooh, gotta do this one! First thought on post title was to tangle the actual letters of my name, probably because I often do name plate tangles for friends and coworkers but when you said on the 3.5″ tile – yikes that would be difficult! Pays to read on – love this idea will have to try it out. I thought the same thing as Cindi did about your challenge, Linda, but Duh! I kept looking and admiring your Zentangle and thought to myself, “That’s funny, that zentangle doesn’t look anything like a name”. Then I read the list of tangle patterns your said you used and it hit me. I see the “Lace” tangle pattern you mention and I recognize the “Nightsbridge” and “Drupe Patterns and it dawned on me what you ment, Linda. After I complete my Weekly Challenge 4 “Starry Eyed surprise”, I’m doing Challenge one next. I have a 6×6-1/2″ journal I hand bound together of high quality watercolor paper I’m drawing my challenge tangles in. I need to add more artwork in my journal. I don’t think I drawn anything since Early December 2010 until “I’m the Diva” Lady came up with the Weekly Challenges. So far I completed Chanllenge #1, #2 and #3 which I will post tonight after work. I’m also planning on working on Challenge #4. 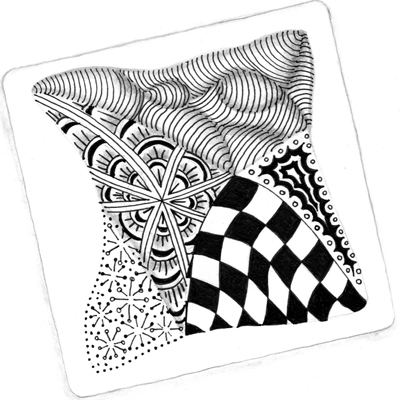 Hi, this is my first Zentangle ever I draw, I bought all the books about zentangles, and I love it! I did my name, on just a paper of a little note book (9 cm x 9cm) cuz I didn’t think it would be good. Used Fescu,Rain,Inapod,Eye-Wa, Drupe,Ahh. this should be the link where I posted my photo, hope it works, it’s all new to me! Thanks Linda! I’m afraid I will be very addicted to this….beside pyrography and scrollsawing and carving . Cookie-i love the woodburning zentangles u did-another inspiring artform that i want to try…what tools do i need and where can i get them? thank u linda and all that contribute …i love it! Hi Andrea, be sure to visit TanglePatterns.com – http://tanglepatterns.com – for lots of great patterns. Hi, andrea. Just in case I forgot to answer you about the tools on woodburning. I went to Michael’s Crafts and got my woodburning kit that came with the heating tool, interchageable tips, a stand with instructions that came in it’s own storage box which is nice. This kit cost abot $ 24.95 and I got 40% off using their coupon. There is also a caining shop for basket weaving or courd decord. This store also carries wood burning tools because crafters that decorate gourds also use the wood burning tools on them as well. The Caining Shop is located in Berkeley, California, but you will have to look in a local store in your area since I’m not sure where your live. Love the pyrography. Looks so rich on wood. I posted all 4 of the Challenges that I’mtheDiva Lady showed us. I also posted my Nick name in Zentangle. I’m also doing my First name (which is also Andrea). I’ll be done with it tonight. I’m hooked on the zentangling your name or a word. Next I’m doing to do my Husband’s name and maybe my entire family’s name. Wouldn’t that be a trip?! Do a huge zentangle of the first or nicknames of each member of your entire family including Mom, Dad and Siblings plus yourself or just limit it to just yourself, spouse and kids. cookie, how ambitious…so as i see it, we pick a zentangle design from the site using the first letter in the design name to coincide w the letters in the name we choose to do … as an artist, i am not used to copying someone elses work but i guess it’s how we design the tangles that will make everyone’s different… i will give it a try 🙂 i am sooooooooo addicted it’s not funny ! i find it’s a great way to stay away fr the frig too lol….. I drew 3 more zentangles using my first name “Andrea” and then I did my Husband’s name. I posted these on flickr and I’m getting ready to post them in my blog. My Husband thought of a couple of idea off your “Zentangle your name”, Linda. Look in my Blog and I will have a more detailed explanation on my Husband’s idea. These are fun to do. When he saw his name, he was so happy and proud that I did his idea. I can’t possibly tell you how much joy I have derived from tangling with you. I have a chronic illness (fibromyalgia and congestive heart failure), but I am able to lose myself is beautiful Zentangles. It is also something I can share with my granddaughter, especially on the bad pain days when I can’t go do something fun with her. We sit and tangle for hours, building memories. Thank you for sharing your wonderful vision with the world. The world appreciates it. Thanks Dena, I’m delighted to hear how much you’re enjoying Zentangle and the memories it’s giving you with your granddaughter. Cheers and happy tangling! Loved your previous site. I’m finding the new site more difficult to navigate and find what I’m looking for.. I find tangles are not as readily available. I hope I adjust to the change..